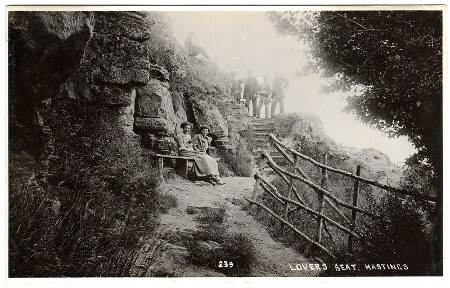 Lovers’ Seat was shown on a map in the Hastings Guide in 1794 and many different stories about it have been written. 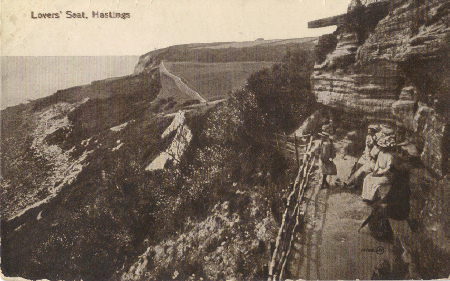 Recorded facts do not bear out most of what is in these accounts and I propose here to leave it as a story that has served Hastings well as a tourist attraction. It is a shame that there in now nothing for visitors to see but I won’t dwell on that either. The following account is from “A Londoner’s Holiday” HSLO 8th October 1870 reproduced from the City Press and I have chosen it because it is a little unique in that unlike the others it does not name the lovers as Elizabeth Boys and Charles Lamb. THIS STORY OF LOVERS’ SEAT. 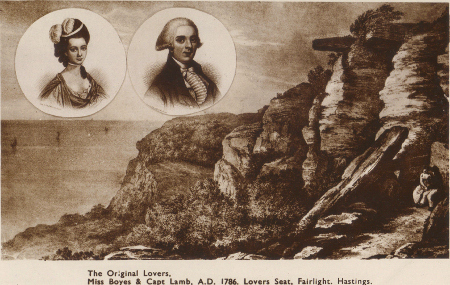 And so on to Postcard 1 that does depict Elizabeth Boys and Charles Lamb. Date unknown, published by Shoesmith & Etheridge of Hastings. The portraits appear on souvenirs produced by T Ross of Claremont and other places but their authenticity does come into question when close examination reveals that the lithographic company responsible was not even in business when they were alive. 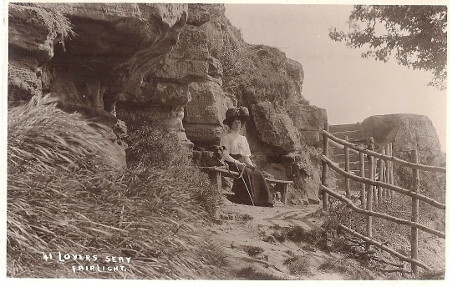 Postcard no 2 is the earliest photographic example I have found so far, postally dated 1902, publisher unknown. The seat itself, a rustic bench consisting of a plank on 4 supports. 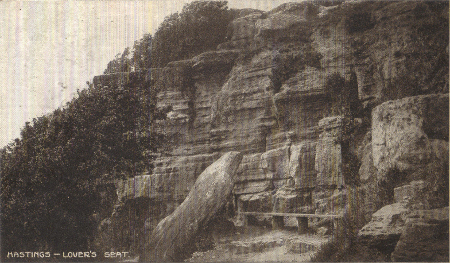 Postcard no 3 is a Judges similar view to the previous, captioned “before the landslip of 1910”. 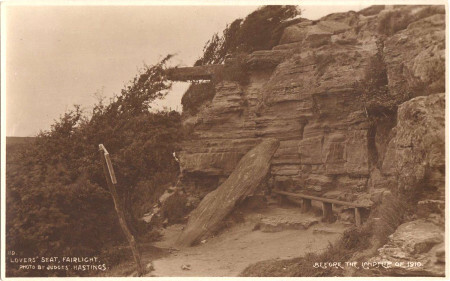 The landslip was reported at the time to have taken place over a number of weeks, leaving just a “narrow ledge” in front of the seat and the “pleasantly wooded slope which once descended from the seat to the seashore has become a glacier of mud and rock”. The slab of rock seen to the left of the seat went down too. Judges had already published this card with the same serial number 119 and just added the caption. What was written on the sign is not known, but as except for one other, the numerous cards with the slab of rock to the left do not show the sign I think we may make the assumption that this was probably the most recent photo prior to the landslip. Postcards 4 & 5 are post landslip showing first the view to the west and the steep slope that is now in front of the new fence. The other view looking east shows the new steps. 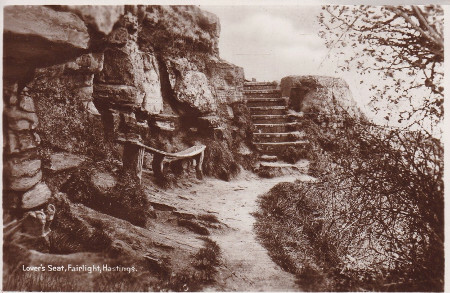 Well the fence didn’t last long, seems to be a Country Park tradition, here it is in Postcard 6, posted in 1914, already falling over. This card has many guises, some with just the 2 ladies, some as here with the 4 men at the top of the steps and others with the 4 men obviously drawn in by hand, both black and white and tinted. Fence completely gone now and the seat looking decidedly tired in Postcard 7. However a very popular card though with again many guises, black and white, sepia and a variety of tints. Earliest postmark seems to be around 1924. The seat apparently completely disappeared during the Second World War, “destroyed by the military”. Postcard 8 probably shows the very one, produced by publishers Excel who are said to only have been active during the years of 1935-55 and this one postally used in August 1939 narrows the date somewhat. The plank now seems to have been replaced by a couple of pieces of 4 x 2. 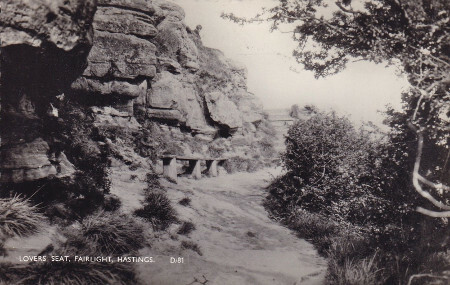 This postcard is also of interest as on the skyline one can just make out the barn from whence Barn Pond got its name. After the war the seat was replaced by the generosity of a Mrs L C Pridaux. This may be it in Postcard 9, postmarked September 1960. If the sender did visit the seat it would have probably been their last chance as it was fenced off for safety that December. The following February it was lost due to landslip but an alternative site was established in March which lasted until swept away in a further fall in1979, seemly forever.